I arranged to meet Megan in Paris on my way home from Asia. 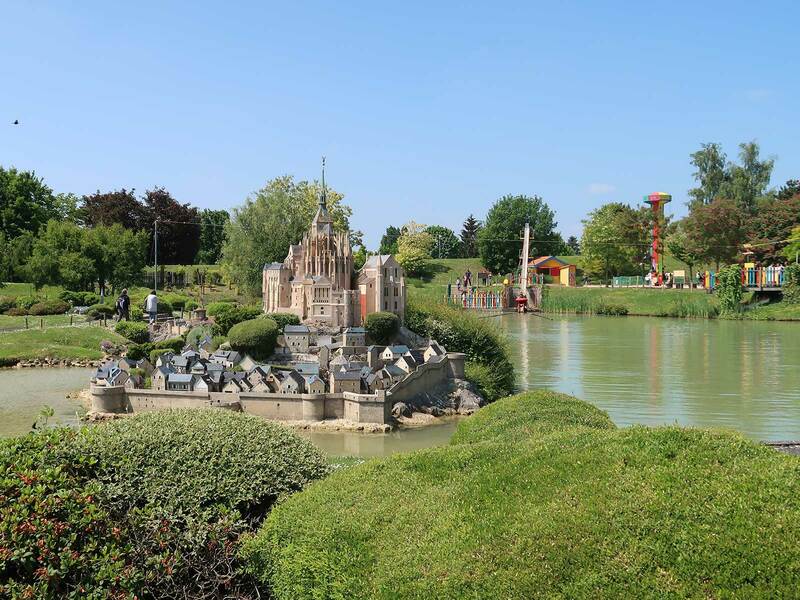 The plan was to spend a relaxed day visiting the revamped Jardin d'Acclimatation and the Foire du Trône, an itinerary achievable (and arguably easiest) without a rental car. Unfortunately a few weeks prior to travel it became apparent that the reopening date for the Jardin had slipped by a month, marking the third time this year that circumstances forced us to revise our plans. There were a handful of new coasters due to open in the general vicinity of Paris, but none of them were expected to be open by our visit, and given that we decided to scrape the bottom of the proverbial barrel with a trip to the only credit neither of us had that was reachable by train: a Heege Butterfly. Our already reconstituted itinerary for the day was complicated yet further due to a train strike. In hindsight this shouldn't have been a huge surprise, as there's about a fifty/fifty chance of industrial unrest in France at any given time as the long-suffering workers fight for the sanctity of a thirty-five hour working week and retirement with a full state pension from the age of sixty-two. On the plus side, the impact today was clearly defined; every other scheduled service was cancelled, and the RER-B was split at Gare du Nord, forcing those wishing to travel into the city to switch. The station was lined with printed signage explaining the disruption; one presumes that it is utilised on a regular basis. The biggest nuisance for us was the reduced service on the Transilien line to La Verrière, with a train running once every two hours. We ended up waiting around thirty minutes for our outbound journey, and left the park a little earlier than we might otherwise have done so as to catch a return without a lengthy delay. The park is around three kilometres from the train station, and though taxis are available we decided to take advantage of the good weather and walk instead; the journey took us around half an hour at a moderate pace. Gate admission is €22 per person, an awful lot for a pathetic coaster (this is a stupid hobby) but a fair price for an elaborate landscaped garden that has been shaped to look like an overhead view of France. It is populated with over one hundred scale models of French buildings, including all the major landmarks (Tour Eiffel, Mont-Saint-Michel, Château de Versailles, et al) as well as many other equally spectacular landmarks that would not be as familiar to those from other countries. The atmosphere today was very pleasant, and quiet apart from the sounds of nature, the whirring of model trains, and unobtrusive low volume music. A small amusement area is accessed by a pedestrian bridge in the north-west of the facility. The rides, which do not require additional payment, represent the highlights from the Heege catalog, including a Luna Loop, Nautic Jet, a Skydive, a Tower. The theming is basic, yet consistent and delightfully whimsical, looking like something that could have been designed by graffiti artists (of which Paris has an impressively large number). Pile Ou Face (#2424), translated as Heads or Tails, is a standard first generation Butterfly that we enjoyed very much indeed. To those who would scoff, I challenge you to try one; they're remarkably good fun! 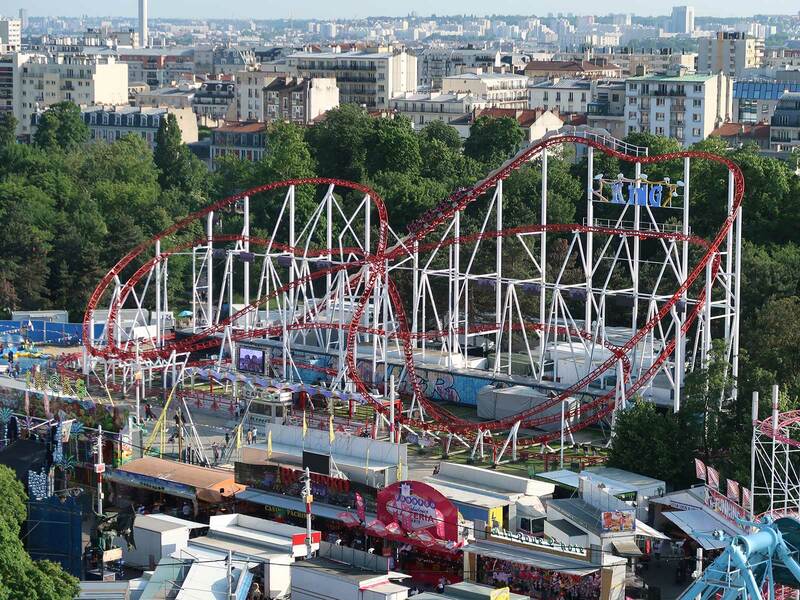 We decided it was worth having a relaxed lunch before heading to the Foire du Trône, as reports from other enthusiasts indicated that some attractions might not open until after nightfall. This precaution proved unnecessary; by the time we arrived in the late part of the afternoon the fairground was bustling with people. As with my last visit there was an aggressive airport style pat down at the entrance, with separate queues for men and women. My power bank was given a very detailed inspection but was approved for entry in due course. Our first stop was at 1001 Pattes (Perc) (#2425), a standard layout Big Apple. The name translates to 1001 Legs, though it is far better known in this side of the world as the local title for A Bug's Life. The station fascia and a backflash under the lift hill feature painted characters from the movie that one presumes are there with official sanction from both Disney and Pixar. Today the hardware was augmented with a bubble machine on the station platform, and the operators were handing smaller children specially printed cardboard crowns. I'd not planned to ride King today, but I realised that it had been over a decade since my last lap, and given that it seemed fair to give the ride another chance. The layout is intense and powerful, and would be worthy of high marks but for the fact that almost every direction change results in a violent snap that the over-the-shoulder restraints transfer directly to passengers. I adopted a defensive riding technique that allowed me to disembark largely unscathed, though Megan was not as successful, describing the experience as an abomination with a collection of four letter adjectives added for emphasis. I asked her if she wanted to ride again, and she indicated that I should engage in some self-gratification with a rubber hose dipped in caramel (subsequently upgraded to sticky toffee). We were much more taken by Infernal Toboggan, a SDC Galaxi that has been a staple of the French fair circuit for over thirty years. The ride operates with two car trains and the experience is essentially the same as every other version of the layout, with one minor upgrade: a multi-coloured tunnel that encloses the second drop. We enjoyed our ride so much that we went back for a second lap in the front seat, from where we experienced some moderate airtime. Coaster enthusiasts, particularly well-travelled ones, have a tendency to regard rides like this as missable, and that's a bit unfortunate; personally I'd much prefer an ERS on even the slowest Galaxi over an ERS on King. Eight years ago I wrote that a new coat of paint could have a dramatic effect on an elderly Schwarzkopf, and that has in fact happened as showman James Montalétang has purchased Alpina Bobs from the now defunct Holly Park. Despite being almost fifty years old the newly reconstituted Jet Star looks like something straight out of the Schwarzkopf factory, with gleaming red track, flags on the lift hill, new signage, and country-specific wraps on each car. Better yet, the on-board experience is perfect, with smooth tracking from start to end. It is wonderful to see this ride getting a new lease of life; hopefully it'll continue operating for many years to come. We took courtesy rides on La Pomme and the prototype Crazy Mouse before concluding our visit with the Wonder Wheel, a fifty metre high Bussink model with alternating regular and enclosed cars. We went for the former, and though the sun wasn't in the ideal place for photographs we nevertheless enjoyed a superb view over the fairground and wider city.